In contrast, in the government funding for the archaeological exploration of Ratiaria amounted to BGN 80,000 (app. EUR 40,900), points out lead archaeologist Assoc. Prof. Dr. Zdravko Dimitrov from the National Institute and Museum of Archaeology of the Bulgarian Academy of Sciences, who has been in charge of the resumed excavations of the Roman colony since 2013, as cited by the Bulgarian National Radio. Dimitrov has appeared discouraged by the lack of funding and the constant looting by treasure hunters of Ratiaria, which has come to symbolize the plight of large-scale treasure hunting in Bulgaria, and the total failure and/or unwillingness of the Bulgarian government to crack down on this outrageous criminal activity. “If things keep going the way they do, there will be no point in dealing with Ratiaria," the Bulgarian archaeologist has stated commenting on the latest reported case of treasure hunting excavations at Ratiaria, which was one of the largest Ancient Roman cities outside the Italian Peninsula during the Late Antiquity. Dimitrov points out that the funding allocated by the Bulgarian Culture Ministry “will not be sufficient for anything". “[Excavations] of Roman cities are very labor intensive, they require a lot of workers and equipment, which is why BGN 12,000 won’t suffice for anything. If the Bulgarian government has no means or policies, and desire to provide state funding for regular archaeological excavations, let it at least provide security for the site so that it can be preserved for better times in the future. BGN 12,000 will only allow us to do some archaeological research but that won’t produce any results whatsoever," says the archaeologist. He adds that because of the meager funding and the lack of social programs for temporary employment, which are often used by research institutes to hire workers for archaeological excavations in Bulgaria’s provinces, his team will rely on high school and university students, and other volunteers in order to carry out at least some excavations. Dimitrov believes that the last reported treasure hunting assault on Ratiaria is a “demonstration" on part of the looters that they practically own the Ancient Roman city. “It became clear long ago that there has to be 24/7 security on the site. The [latest] assault occurred at night, and was completely purposeful because it deliberately targeted the sections where we work. This is a demonstration by the treasure hunters that this is site belong to them, the lawlessness goes on, and this region there is the Wild West, or the Wild Northwest. 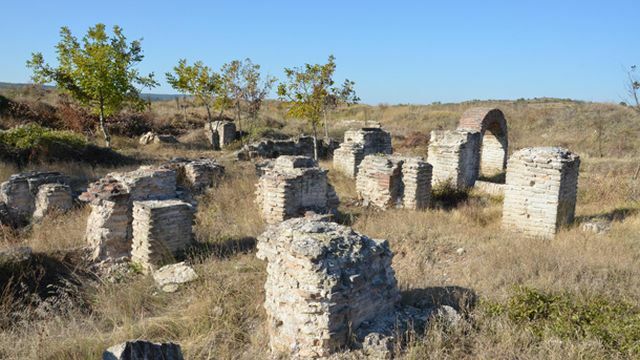 It will be like that until the institutions start working," the archaeologist stresses regarding the region of Archar in Northwest Bulgaria. Lozan Lozanov, the Mayor of Dimovo Municipality where Ratiaria is located, argues that his administration has no means to pay for 24/7 security of the Ancient Roman city. “We have appointed two people as security guards working during the day. This is what we can afford. It is hard to provide security at night. When you go there in the morning, you can easily find a dead body… This comes at the expense of the municipality. I can’t think of other measures. There is the government, the police, let them intervene, we can’t do it," Lozanov says. The Police Directorate in the District of Vidin, however, states that the police department in Dimovo Municipality cannot boost the security of Ratiaria because it has to patrol in 16 towns. All it does is carry out occasional police raids on the site of the Ancient Roman city; the last case of an arrested treasure hunter there was on March 9, 2015. The treasure hunting plight of Ratiaria (and Bulgaria, for that matter) was documented in a 2009 documentary of Dateline on Australia’s SBS TV entitled “Plundering the Past". This film pretty much makes it clear that the looting of Ratiaria keeps taking place on an hourly basis so announcements about new damages are no news. The overall damage sustained by the Roman city from modern day treasure hunters can hardly be calculated. The treasure hunting plight of Ratiaria (and Bulgaria, for that matter) was documented in a 2009 documentary of Dateline on Australia’s SBS TV entitled “Plundering the Past". The damage done to one of the largest Roman cities outside Italy can hardly be calculated. The archaeological excavations of Ratiaria were resumed in 2011 by archaeologist Krasimira Luka from Sofia University “St. Kliment Ohridski", and in 2013 by Assoc. Prof. Dr. Zdravko Dimitrov from the National Institute and Museum of Archaeology of the Bulgarian Academy of Sciences.